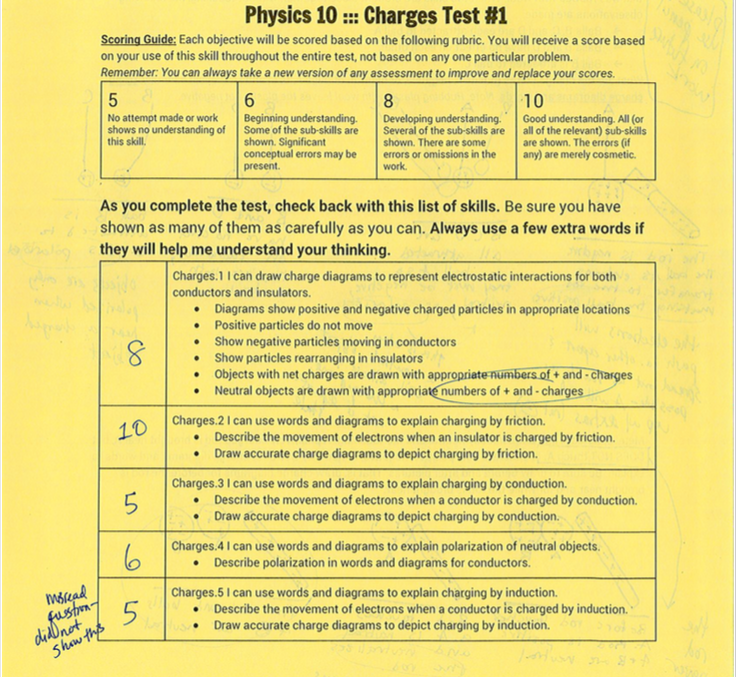 Standards-Based Grading: 5, 6, 8, 10 – Physics! Blog! I taught at a new-to-me school this year, and it currently has a lot of one-trimester-long classes, including for the 9th and 10th grade sciences (they rotate through biology, chemistry, and physics, though not in a particular order). These little “tastes” of physics make it more challenging to develop a class culture and get to the meatier work of learning physics. They also make it more challenging for students to figure out how to be strategic and make best use of the grading system in the class. Keep as much as possible of the pieces that made SBG so successful for me in the past. Here, that meant allowing for many retakes of objectives, writing objectives that made it clear to students what they needed to do to earn a high score on them, testing each objective multiple times, demanding high quality and consistent work to earn a full mastery score. Make sure students can get their brains wrapped around what’s happening with grading as quickly as possible so they can make use of the system and get more benefits from it. Here, that meant using the best score instead of the most recent score (more on that later), having “partial credit” type scores, and using scores that were “out of 10” so that students immediately connected a score with how it might translate in the end. Here is some text from my “Quick Guide to Physics Grading” page on our class website (seen by students and parents) about what I ended up using. Objectives: These are the skills that you are going to master during this course. There is a list of them on the Objectives topic page. When you take an assessment, instead of a grade for that test, you will get scores (5, 6, 8, or 10—see below) for each relevant objective. You can always take a new version of any assessment to improve and replace your scores for the objectives. Only your final scores will count. Your final understanding is what matters, not how quickly you get there. Free Quizzes: I will do my best to give you many free (ungraded) quizzes so that you can get some feedback and practice before tests. There will be take-home quizzes. You should treat them as an assessment (no other resources, etc). I will write you feedback on them, but I will not grade them. 10: Good understanding. All (or all of the relevant) sub-skills are shown. The errors (if any) are merely cosmetic. 8: Developing understanding. Several of the sub-skills are shown. There are some errors or omissions in the work. 6: Beginning understanding. Some of the sub-skills are shown. Significant conceptual errors may be present. 5: No attempt made or work shows no understanding of this skill. I will use your best score for each objective. Since we will have more than one test this trimester, you might get a score for an objective more than once. When I calculate your grade for the trimester, I will only use each objective once, even if that objective was on multiple tests. For that purpose, I will use your high score for each objective. If you get a lower score on a later test, though, be sure to do some review and practice on that skill—later objectives depend on the earlier ones, so it is not wise to forget everything once you’ve tested it. Why isn’t there a 7 or a 9? First, I wanted to keep the total variety of scores small. 5, 6, 8, 10 is just one additional category from my 0, 1, 2 default. In my head, it translates to 5: I can’t give any credit for this; 6: This needs a lot of work, but it should not be no-credit; 8: I can’t justify full credit for this yet, but it’s getting close; and 10: I feel confident that I can give this student full credit for this skill. Second, if a student had straight 8s (or largely 8s), that would be around a B- grade, something that is considered a “danger” zone grade at my school. (For example, if we expect a student might end up with a B- for the trimester, we are supposed to write them an interim report.) So the not-yet-perfect score is not one that students would typically want to settle for all the time. If I started giving 9s, it would allow students to feel comfortable leaving their skills there. When they get some 8s, they want to keep working. So even if they are very, very close, I want to see them do it one more time and really get the concept. Same for moving 6s to 8s (or to 10s! )—the score gives some credit, but motivates students to keep working. At the same time, the highest grade I can give is an A (we don’t do A+ grades), so students max out at a 93. That makes a few 8s okay, but almost makes 9s even more of a complacency-inducing score. The low score of 5 is because I only see the need for one “bin” of failure. If you can’t do anything and get all 5s, you still fail. No one cares if you got a “high F”. But if you need to declare bankruptcy on an objective here or there (for whatever reason—maybe you were absent a lot and can’t catch up on everything; maybe you are really struggling in your history class and need to focus your efforts there; etc, etc), it shouldn’t drag you down so far that you can’t recover from it. For each major unit (I basically had about 3 units in my 10th grade class), we had at least 2 (usually 3) in-class tests. These were generally full-period (50 minutes) or majority-of-period tests. They covered multiple objectives, and they covered each objective multiple times. Remember, I’m using the best score, so I need to feel confident about, for example, giving a 10 to a student on an objective. That means I want to test it multiple times before giving that 10, and that means “tests” rather than the short weekly “quizzes” I would really prefer. The first test was usually partway through the unit and was an early set of data for me on how we were doing. The second test was usually at or near the end of a unit. The third test was usually once we had moved on to a new unit. Many of the same objectives were on every test for that unit. That is, a skill was usually tested in class at least twice, giving students multiple opportunities to secure a good score without needing to come in for a retake, making both my life and their lives easier. It also lowered the pressure on that early-in-the-unit test—they knew (and I would reassure them as I handed it out) that they would get another chance at these, so they should just relax and do their best for now so they know what needs more work. Here’s a typical front page of a test in my 10th grade class. This test was the first of the trimester, and it was a typical result for a first test in a unit. (This student was a really excellent thinker and worker, and she ended up with an A for the trimester despite the early challenges of learning physics. Woo!) The front page told students what objectives I would score on that test, but it did not tell them which questions would contribute to which objective score. As per usual, a single question would likely hit more than one objective at the same time. For someone wanting to adopt this SBG flavor for a year-long class, I might recommend one additional change to balance out using the best score over the most recent score. You might make a rule that the highest score available for an objective is an 8 the first time it is tested. That would mean that to secure a 10, the student would have to do well on the second test of the same objective, but it would allow them to already secure a decent score if they are ready for it early in the unit. In the 10 week class, there just wasn’t the time for students to cycle through each objective multiple times, so using the most recent score was too challenging for the timeline. It was very rare for a student to go down in score by more than one category from one test to another, so I felt okay about the way I was testing them and about using the best score. I might also recommend this type of approach for someone trying out SBG for the first time (or in a new school) because any pushback I’ve gotten for SBG is really only about using the most recent score. The realization that students have over how the most recent score (annoying as it can be at times) is actually not such a big problem for them takes time, and asking students to immediately trust you in that way when you are new (or trying something for the first time) is the toughest part. Of course, I also had out-of-class retakes available for students. I set up a form for them to apply for a new test. They could request up to 4 total objectives at one time (from any unit). I had them choose from a list of times we were both likely to be available, and I had them answer one question (which they generally answered really well!). Because there were multiple chances in class, and because they got to keep their highest score, the number of these out-of-class retakes was actually really low. But for the students who took advantage of it, it usually made a big difference, and they really appreciated the opportunity. I already wrote at length about how I handled the final assessment for my 10th graders, so here I will just say that I used the final assessments in each class as an additional part of the grade, not to change their scores on objectives. So students knew they had to secure whatever scores they wanted before we got to Reading Day and the final assessment week. I like the grading system because I think it gives students a better chance to get good grades. It can be confusing at times though. For example, it can be unclear sometimes what parts of the test/quiz are being graded for. I personally like it. I think it gives you many opportunities to improve and work on your grade even if you are not naturally great with physics. I like the compartmentalization, it is graded by section so you know what you need to work on and what you are doing well on. The numbering of 5,6,8,10 is a little weird, but once it was explained it made sense. The ability to retake quizzes is helpful because it is solely based on how much you know about the topic in general, and not just in the moment of the quiz. Next year, I will be teaching only trimester-long classes (my loan to the math department has expired, so I will be back to teaching all physics and science electives). The current plan is to stick with this 5, 6, 8, 10 system since it has made the most sense to me in the short classes. I will be writing new objectives, though, since I will have several new preps (and even this same course for 10th graders will have a different set of topics). After conversations with colleagues about the advantages of SBG, and your presentation at BGSU last year, I took the dive and used SBG for my full year physics and physical science class for the first time last year; I used the 0 1 2 scale and it went quite well. My students liked it and I loved it! I do see the value of the 5 6 8 10 scale you discuss in this article. Would you recommend going to the new scale for full year classes? Being a newbie to the system, I value your opinions and ideas. Thanks for sharing! Awesome! 🙂 So glad to hear both that you’ve tried something new and that you and your students found it useful. My recommendation is to stick with what is working if you like it. It will be less work the 2nd time around already, and students will know a little about it because others have experienced it. To be honest, when I changed the system for T2, my students asked why I had changed it (because they had already heard about it from the T1 group—who were nervous at first, but mostly liked it by the end when they understood it). I’ve been thinking about going to a system like this because I think it will make the transition to a final letter grade easier and also allow me to ‘enter grades’ more often (*sigh*…). My biggest fear is the complacency of partial credit…With my current letter rankings – Mastery, Progressing, Starting, No Evidence – students only got credit for the top level (which I’ve renamed from ‘Mastery’ to ‘Got it!’ for this year) Did you find that many students would just accept the 8 and not try for the 10? Thanks for posting Kelly! If you are thinking of also going to the maximum instead of the most recent, you might also consider using the average of the top two scores instead (and make sure that if they have only one score that it is averaged with a 5). That might not promote the quest for mastery, but it will work on consistency, at least.